AMTECH offers all types FEP/PFA lined Fittings available.Lined Elbow,Tee,Reducer & flanges in best quality.Amtech regularly exporting and supplying PTFE Line Pipings. We are offering piping mfg. of a seamless ASTM A106, SCH-40 steel pipe and is confirmed to the requirements of ASTM F1545. 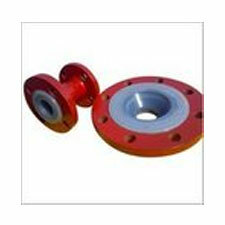 We supply these products with fixed or loose flange design and drilling specifications up to 8" NB sizes. Our fittings best suitable for compensating thermal expansion,very safe against vacuum,very resistance to thermal contraction,and protection against permeation. The thermal equilibrium prevents fatigue cracking failure between the tube and flared section of the liner. We also have Jacketed Lined pipes are also available as a solution to customer's typical applications and uses.